I am a huge fan of the Argeneau series. 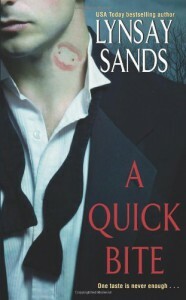 I love the uniqueness of Lynsay Sand's version of vampires. I have this thing for authors that use different ways of depicting vampirism. The Argeneau series is fun and always easy to read. As many of the books that I have read it hasn't gotten old yet. It is one of the few series that I usually purchase the day that it comes out. That's saying a lot if you ask me. So if I'm such a huge fan why on earth am I reviewing book 1? Because I felt like reading somethinglike the Argeneau series and after failing to find something recommended that I haven't read already I decided hell I'll just re-read this one! What shocked me almost from the start is that I barely remember this book. I originally read it almost exactly 2 years ago. This story is about Lissianna and Greg. It's sort of an introduction to the Argeneau. There are some things not included in this book that must have evolved some to the series in later books. It features my favorite matchmaker Marguerite Argeneau. She is the mother of Lissianna and she kidnaps Greg to help Lissi with her phobia. Lissi is a vampire that faints and the sight of blood. Just that premise lets you see how comical these books are. But they are also very romantic as well. It was really fun reading about characters from later books such as Thomas, Mirabeau and Jean Louis. Although this is a good introduction to the Argeneau's I wouldn't rate it as my favorite book in the series. I would have to say that award would go to Marguerite's book. It's still a great book and I love Lissi and Greg. So if you like vamp books and are looking for something different than this might be for you! Just keep in mind it is meant to be humorous. I get sick of reading reviews for this series giving it a hard time. If you like the Love at Stake series you will love the Argeneau.